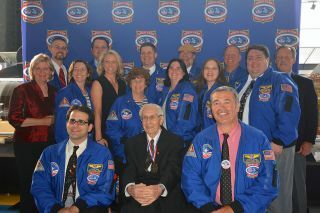 Members of the Space Camp Hall of Fame gather at the 2014 induction ceremony, Aug. 8 at the U.S. Space & Rocket Center in Huntsville, Alabama. Top row, left to right: Ed Van Cise (2012), Josh Whitfield (2008), Burke Hare (2011), Jim Allan (2009), Dan Oates (2007) and Hoot Gibson (2012). Middle row: Mary Tuncer, for her late husband (2014), Liz Warren (2012), Michelle Ham (2014), Marlenn Maicki (2008), Penny Pettigrew (2007), Amanda Stubblefield (2007) and Robert Pearlman (2009). Bottom row: Vincent Vazzo (2008), Georg von Tiesenhausen (2007) and Danny Jacques (2010). HUNTSVILLE, Ala. — A European astronaut, a former NASA trainer and an entrepreneur who encouraged a new generation of international space travelers have been hailed for their success by the institution that helped to inspire each of them: Space Camp. Astronaut Samantha Cristoforetti, former astronaut trainer Michelle Ham and the late Kaya Tuncer were inducted into the Space Camp Hall of Fame during a ceremony held Friday (Aug. 8) at the U.S. Space & Rocket Center in Huntsville, Alabama. As members of the 2014 class, they now join the 28 alumni, former staff members and friends of Space Camp who have been enshrined in the hall since 2007. The Hall of Fame was established to honor the outstanding members of the Space Camp family, including graduates and former employees who have distinguished themselves in their respective careers, and friends of the U.S. Space & Rocket Center who have made considerable contributions of personal time, effort or resources to further the goals of the Space Camp programs. "As of the end of our summer session of 2014, we have had 650,000 graduates from Space Camp in 32 years," said Deborah Barnhart, CEO of the U.S. Space & Rocket Center. Members of the Space Camp Hall of Fame welcome European Space Agency (ESA) astronaut Samantha Cristoforetti into their ranks. From left to right: Liz Warren (2012), Andrea Hanson (2010), Amanda Stubblefield (2007), Samantha, Jim Allan and Robert Pearlman (2009) and Valerie Meyers (2011). Cristoforetti, 37, was unable to attend her induction into the Hall of Fame because she's currently at the Yuri Gagarin Cosmonaut Training Center in Star City, Russia, preparing to launch on her first flight to the International Space Station this November. Cristoforetti, who is from Milan, Italy, was selected as a European Space Agency astronaut in 2009. "What happens to you when you train for a long time is that it becomes part of your normal life, and you tend to lose that sense of excitement, that wonder, that you really should have every single day," she said. "And then, once in a while, something happens that brings it all back into perspective, and you're overwhelmed again with that sense of wonder and saying, 'Oh wow, I'm really getting to go to space.'" "What it is many times is that you get a chance to meet young people, boys and girls, and to see yourself and your experience, what you do, through their eyes," Cristoforetti said. "Tonight, being here with you and thinking back to my time at Space Camp, it is such an experience that is even more intense because, in a way, I am seeing myself and my experience as an astronaut through the sparkles in the eyes of my younger self." Cristoforetti attended Space Camp in 1995 as a foreign exchange student. "My belief is that, going to Space Camp when I was 18 years old took that dream [of flying in space] I had as a child and made it even stronger," she said. "I'm sure that it helped me keep it alive and strong throughout the years until quite recently, [when] I had a chance to actually become an astronaut." Inductees into the Hall of Fame are presented with a blue flight jacket, an engraved medal, a certificate and a small Space Camp flag that flew aboard the real space shuttle Discovery's STS-124 mission in June 2008. The pilot on that flight was astronaut Ken Ham. "To Space Camp, you guys are like, 'Oh, that's cool! It's the flag that Ken flew,'" Michelle Lucas Ham, Ken's wife, said upon accepting the flag during her induction into the Hall of Fame. "And it is cool, but for me, that was one of my first space-shuttle crews that I got the joy of training." For 10 years, Ham worked at the Johnson Space Center in Houston as an astronaut instructor and operations planner for the International Space Station program, teaching the crew members about the inventory and stowage system aboard the orbiting outpost. During this time, she trained nearly every astronaut in NASA's corps, as well as international crew members, for their flights to station. But it was her own training as a Space Camp attendee that helped prepare Ham for her future in the space program. "I've dreamt for as long as I can remember while looking at the stars, and Space Camp was one of those dreams at one point — and it almost seemed unobtainable, like I couldn't attend," she said. "Then, my mom and my dad — they scrimped and they saved to get me here the first time after I watched the [1986 'Space Camp'] movie." Ham attended Space Camp in 1991 and 1994. Today, she has launched her own company, Higher Orbits, to encourage students to develop an interest and pursue careers in the fields of science, technology, engineering and math — also known as STEM. As Ham is doing now, Tuncer used his passion for space and his entrepreneurial skills to inspire children. In June 2000, Tuncer opened Space Camp Turkey in Izmir, which more than 150,000 students and adults from 50 countries have attended to date. "Kaya had a plaque made to put at the entrance of Space Camp Turkey — it is still there — [and] it reads, 'A gift to the youth of the world,'" Mary Tuncer, Kaya's wife and the co-founder of Space Camp Turkey, said on accepting her late husband's induction into the Hall of Fame. Born and raised in Turkey, the pinnacle of Tuncer's successful career as a businessman and builder was when he established the Aegean Free Zone in 1990. The 500-acre industrial park attracted foreign investment from top international companies, creating more than 20,000 jobs. "Kaya's success as a businessman and a developer gave him opportunities to do many things. What he chose to do reveals his character and what he found important," Mary Tuncer said. "Last year, I went with a colleague to visit one of the very successful companies in the Aegean Free Zone, where Space Camp is located, she said. "We went to the offices of this high-tech factory. It was made of the finest materials — marble floors, reflecting pool, the couches were covered with the finest Italian leather — no expense was spared. After I left, I told my colleague, 'Kaya could have had an office like that; instead, he built Space Camp Turkey.'" In 2002, Tuncer established the nonprofit Global Friendship Through Space Education foundation, which has provided scholarships for more than 5,300 children from 27 countries to attend the Space Camp he founded. For more information about the Space Camp Hall of Fame, visit spacecamp.com/hallofame. Robert Z. Pearlman is editor of collectSPACE.com, a Space.com partner site and the leading space history-focused news publication. Follow collectSPACE.com on Facebook and on Twitter at @collectSPACE. Follow us @Spacedotcom, Facebook or Google+. Originally published on Space.com.